All through the recent dry winter Utahns were regularly assailed with weeping, wailing, and gnashing of teeth about the impending drought crisis. The wet spring alleviated the worst concerns. But everyone in Utah knows that we're in a low water year. This level of consciousness has led water crisis mongers among us to invoke with righteous indignation a practice now known as drought shaming. That's when they take to the modern pillory of the internet to shame those they think are obviously wasting water; running sprinklers during a rainstorm, watering in the middle of the day during peak evaporation, etc. I myself have spouted a few hardy tsk-tsks when seeing neighbors water their lawns at such politically incorrect times. After all, nothing improves self esteem better than self righteously putting down those that fail to live up to our superior judgment. One moral superiorist that I know is seriously considering xeriscaping his yard — as if rocks and weeds will make his yard a pleasant place for his progeny to play. My effort to avoid drought related publicity problems amounts to setting my sprinkler cycle to run at 1 am. Not only is this during the low evaporation window, it happens to be the time of day when fewest people are awake to pay attention to my sprinklers. So nobody knows when I water during a rainstorm. The vast majority of shaming by the self appointed drought police is aimed at residential and commercial offenders. But those that are eager to trash others for water misuse might want to pay attention to this recent KSL.com report that explains that only 18% of Utah's water is put to residential or commercial uses. What? That's right. Only 6% of Utah's water goes to watering residential yards. 4% gets used inside our homes. Only 8% is used commercially. Where the heck does the remaining 82% of our water go? To agricultural uses. Shamers ought to realize that even if everyone in Utah stopped watering their yards during rainstorms, quit watering in the middle of the day, only flushed their toilets after #2, took brief showers, and employed all of those other water saving tips we constantly hear about, the result would amount to far less than 1% difference in water usage. Those sitting on their high horses about water usage seem to generally give farmers a pass. This may be due to the fact that few of these busybodies live in agricultural regions. And/or it may have something to do with the whole bucolic idea of farming and the fact that all the food we eat ultimately comes from farming. It turns out that our farmers have a massive problem with poor water management. But it isn't really any single farmer's fault and it's difficult for a farmer to do much about it. "We do not have a water crisis" says U of U Professor Daniel McCool, a specialist in Western water policy. "We have a water management crisis." The problem stems from Utah's water laws, that were developed during the 19th Century when most of the state's population was actively engaged in farming. Per KSL, Professor McCool "said agriculture has so much water — and farmers get it so cheaply — that there's no incentive to conserve." Moreover, "traditional Western water law discourages conservation." If a farmer reduces water usage through efficiency, the law punishes them by taking away their right to it. So farmers have little incentive to implement efficiencies. Vast amounts of water are wasted through evaporation and seepage from open dirt ditches because farmers have little incentive to pay the cost of implementing modern piping. Some might be quick to point out that increasing farmers' costs would lead directly to increased food costs at the grocery store. Sort of. The market is far more complex than that. Farmers would respond to increased water infrastructure costs in a variety of ways, including shifting crops and shifting land to other uses. The rest of the world's agricultural market would react to the opportunities these shifts reveal. Some food costs would increase, but others would go down due to more efficient use of worldwide agricultural resources. Here is how our outdated water laws work for alfalfa hay, "which consumes relatively high amounts of water." Utah farmers sell "much of the hay" to China for dairy cows. McCool says, "Farmers are using thousands of dollars of water to grow hundreds of dollars of hay" And "that's equivalent to exporting Utah's water to China with a relatively low financial return." But since farmers bear only a fraction of the cost of the water, transactions like this work financially for them. Maybe our water laws made sense back in the 19th Century, but they hardly make sense today. Efforts to reform the state's water laws have met with little success. But that might change if more Utahns were more educated about water usage than the limited scope presented in public service announcements. I encourage drought shamers to quit wasting their time hammering away at residential and commercial folks that use a small fraction of the state's water. Put your self righteousness to good use by focusing instead on those that could really save water in Utah. 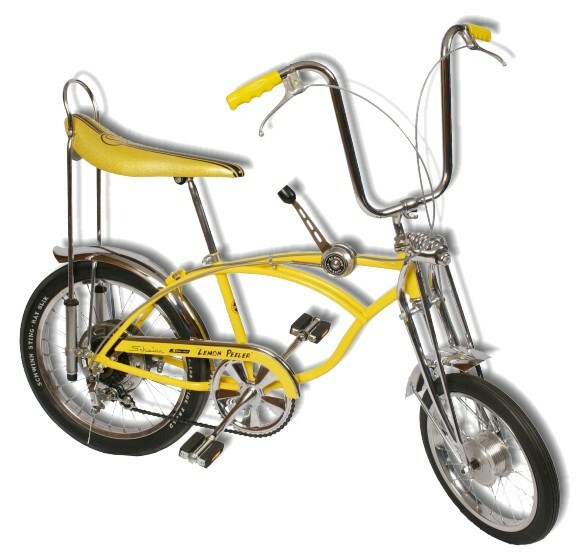 Yup, a lemon yellow Schwinn Stingray 5-speed bike. My older brother had a red one. My younger brother had a green one. The kid across the street had a black one with "ram horn" handle bars. So these kinds of bikes were plentiful. I eventually added a shock absorber enhanced seat that came standard on the more expensive Lemon Peeler model. Of course, I didn't get the reinforced frame, wide rear tire, or fancy spring loaded front forks with disc brakes. Way too expensive. During the warmer months we lived on our bikes. Our dads weren't always around to work on the bikes when they needed repair, so we learned to do many repairs on our own. That including adjusting the rear derailleur, which was always a tricky thing to get right. I never did learn all of its secrets. Speaking of the derailleur, why is it that we use the French spelling? Is this just an attempt to raise the status of that nasty piece of equipment, kind of like trying to make people think that eating snails is a good thing by calling the dish escargot? My daughter held onto her little girl sized bike until this spring, when we could no longer adjust it to fit her stature. She got a hand-me-down 24-inch 21-speed model that an older brother no longer used. It was in good shape. I cleaned it up and she soon found that she enjoyed riding it quite a bit. That is, she did enjoy it until she took it to a bike clinic at a local junior high school. A few days later she came in reporting that the rear shifter wouldn't move off 7th gear. Despite my busy schedule that day, I spent about 10 minutes trying to repair the problem. Unable to get it to work any better, I told her we'd have to take it to a family member that used to work in a bike shop. A couple of days later when I went to pull the lawn mower out of the garage, I saw that my daughter had scrawled "BROKEN" on the garage floor using pinkish-purplish chalk. There was an arrow pointing to her bike. Suffice it to say, I got the message. After mowing the lawn, I again pulled the bike from the garage and inverted it on the driveway. After trying a few things and getting my hands very greasy, I realized I was hopelessly lost. So I searched YouTube and clicked on one of the many videos about rear derailleur repair. The instructions were simple enough for me to understand. 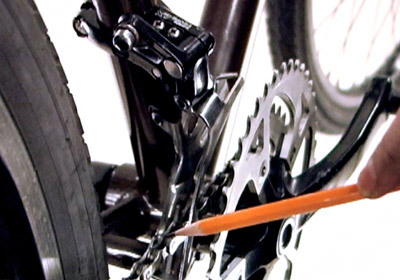 Adjust the H (high) screw so that the chain rides smoothly around 7th gear without falling off. Shift to 6th gear and adjust the tension on the shifter cable until the chain rides smoothly around the 6th sprocket. In theory, if you can get it to shift properly between 6th and 7th gear, all of the other gears work right. Shift to 1st gear and adjust the L (low) screw so that the chain rides smoothly around the 1st sprocket without falling off. One problem was that the junior high kids had left the cable very loose, with more than an inch of play. I had to undo the cable screw and try to get it tightened just right, a process that would have been much easier if I had sported a third hand. After tightening the cable, tweaking a lot of things, and a lot of grousing on my part, the rear mechanism started to work. But then everything went haywire on the front derailleur. I assumed that adjusting it would pretty much follow the pattern used for the rear derailleur. I was wrong. So I went back to YouTube. "The best front derailleur" said the bike mechanic, "is no derailleur at all." He said that it was probably the most fickle and problematic part of a bicycle. Nice. I wish someone would have told me that when I was acquiring bikes for my boys. But would I have even believed them? I probably would simply have accepted the marketing hype that says more gears is better. I tried following the mechanic's instructions, but nothing worked right for me. He said that I should get 1st gear working right first, but that was disastrous. I again found myself dealing with cable length, which was so messed up that adjusting the little ferrules was futile. At first I had it so tight that the shifter wouldn't move. Then I had it too loose. Finally I gave up on 1st gear and worked on getting the tension right on 2nd gear. Just when I was about to give up hope, the thing started working right. After adjusting the H and L screws, everything seemed to work fine. I took the bike for a quick spin up and down the street and around the cul-de-sac (arrgh, another French word), shifting through all of the gears, and they all seemed to work. Success! I had won a skirmish in the derailleur wars. It took more than an hour of hot, greasy work. But me, YouTube, and my tools, along with some help from my wife, had carried the day. Of course, I may be called upon anytime to re-engage. Those derailleurs are temperamental enough that battle may soon be required again. At least they are working for now. I parked the bike in the garage, put away my tools, and scrubbed the grease off my hands. Then I reported to my daughter that her bike — which she had been so anxious to ride — was now fixed. She and a friend were busy doing something, so she barely acknowledged me. Over the next couple of days I kept dropping hints that the bike was fixed and that I'd like to see how it works for her. I think it's still sitting where I parked it on Saturday.